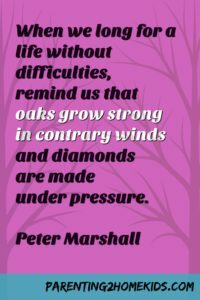 We all have hard days and sometimes hard weeks and hard months (and maybe even rough years). 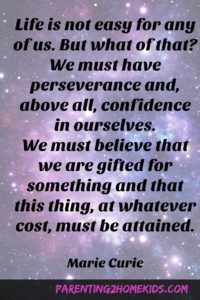 Inspirational quotes about life are one of my favorite things and there are four quotes that guide me when life gets hard. These four inspirational quotes about life help me keep calm during the storms of life or the storm of the hour. I keep them posted near me as reminders. One is on my computer and two are on my office wall, so I look at them often. I came across the first one decades ago when I was at an adult retreat center. “There are people who go around and see nothing but beauty and are remarkably insensitive to the immediate human needs surrounding them. There are others who get so obsessed with the humiliated that they forget the sun rose today. To keep life in some kind of balance, you’ve got to keep the tension alive between them. This quote reminds me that life has pain and beauty and the tension between the two makes life beautiful. In the therapist part of my life, I usually deal with people when life is at its most chaotic or painful: during divorce, chronic illness, severe injury, depression, or anxiety. In all of these situations, it’s important to remind people to look for the good in life. This is one tool for regaining balance. Even when it feels like everything is going wrong and nothing in life is good, there are exceptions. Looking for those exceptions is an effective method of retuning the violin that is your life. Who is William Sloane Coffin? Some quotes are more meaningful for me when I know the context. William Sloane Coffin was a clergyman, a CIA agent, and a peace activist who lived from 1924-2006. I am not sure where he wrote or said this quote, but when I read it I think of the 1960’s and 1970’s and the activism he was involved with. Even in an era of rampant racism, there was also unbelievable beauty. In the turbulent time that was the 1960s, some people were clueless about the pain of others. Others were consumed with the pain of life and did not see the beauty. Coffin reminds us that we need to try to find a balanced view of the world and our lives as a whole. Even in painful times, there is beauty and there are people who show caring and compassion. We choose our focus. For example, friends and family add beauty to life, especially when times are hard. I talk more about how to build that support system in How to Build Your Tribe After Divorce. This is the quote I look at every day. I cannot sit at my desk without seeing it. I love the image of an oak tree growing strong because of, not in spite of, the wind. Peter Marshall was a Scottish-American preacher who became chaplain of the US Senate. He lived from 1902-1949 and he believed that religion should be fun. 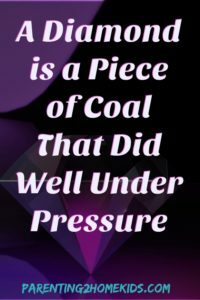 The idea of a lowly lump of coal turning into a beautiful diamond due to pressure inspires me to persevere. When I look back at my life, I realize that the challenges I faced made me the strong woman I am. It has taken me many years to recognize that while I am under pressure. Sometimes I still do not, but looking back it’s obvious that the pressure was a benefit. Explore how difficulties can be good for us in Gifts of Hardship and What to Do About Hardship. This quote is on the cover of my laptop. I look to this quote when life seems hard. Marie Curie’s words remind me that life is not easy for any of us, but we all must go on. I must focus on my calling, being a clinical social worker who works as a psychotherapist, because that is what gives my life purpose and meaning. When life has purpose and meaning, we have not only happiness, but true joy. Curie was a Polish chemist and physicist who conducted pioneering research on radioactivity. She was the first woman to win the Nobel Peace Prize, the first person to win it twice, and is still the only woman to win it twice. She lived from 1867 to 1934, a time when it was rare for a woman to be in a STEM career. The final quote is from Lutheran Book of Worship and is known as the Holden Prayer. is the retreat center that has claimed the prayer. Holden Village is a unique place. You can only get there by going on a 22-mile boat ride followed by an 11-mile ride in an old-school bus up a very steep mountain road. Many people visit to refresh themselves physically, emotionally, and spiritually for a week. Another group of people go there to seek refuge during times of transition. The prayer takes on a much more poignant meaning for the second group. 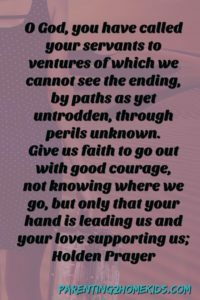 And yet, all of us travel unknown paths to which we do not know the ending. These four quotes help me when life is hard or uncertain. They remind me that hard times and uncertainty are parts of being human. Often, these difficult times work out so that life becomes even better than it was before. What is your favorite inspirational quotes about life?